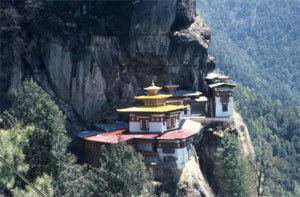 This tour will take you to the Himalayan enclaves of Nepal, Sikkim Bhutan. After admiring the graceful pagodas, temples and stupas of the Kathmandu valley in Nepal, fly east to Bhadarpur then cross the Border Darjeeling and then on to the monasteries and market of Sikkim. From sikkim drive to Bhutan. In the 'land of the peaceful dragon,' Bhutan, your visit includes the valleys of Paro and Thimpu, the capital of Bhutan, and the picturesque Punahka and Wangdu valleys. A wonderful kaleidoscope of Himalayan cultures, religions, peoples amongst scenic grandeur. Trip Start with sightseeing in Kathamndu then fly to Bhadarpur, Kathmandu- Badrapur (45 minute flight), drive a short distance of 30 minutes to the Nepal-Indian border of Kanbarbita to meet your guide and transport begin tour of Sikkim; drive (4-5 hrs) to Gangtok, hotel. Sightseeing in Sikim, Drive (5 hrs) to Bhutan. Bhutan. In the 'land of the peaceful dragon,' Bhutan, your visit includes the valleys of Paro and Thimpu, the capital of Bhutan, and the picturesque Punahka and Bhuthnag valleys, Visit Tongsa Dzong and Ta-Dzong. Day 1: Fly Kathmandu, overnight and hotel. Day 2-3: Sightseeing of Kathmandu valley. Day 4: Fly Kathmandu- Badrapur (45 minute flight), drive a short distance of 30 minutes to the Nepal-Indian border of Kanbarbita to meet your guide and transport begin tour of Sikkim; drive (4-5 hrs) to Gangtok, hotel. Day 7: Drive (5 hrs) to Bhutan, Phuntsholing; Bhutan visa will be stamped on to passports to make ready for next days journey to Paro valley. Day 8: Drive (6 hrs) to Paro valley- a most scenic drive on the historic road that opened Bhutan to the modern world in the early 1960s; you can witness far flung villages, waterfalls etc, steady climb from the foothills at 500m to about 3000 meters before decending gradually into lush Paro valley. Day 9: Sightseeing of Paro: including hike to Tiger Nest monastery, visit Kichu Lhakhang, Rinpung dzong, Tadzong Natural History Museum, Drugyal dzong. Day 10-11: Visit and sightseeing of Thimphu- capital city and seat of government. Day 12-13: visit Punakha, Gantey and Wangdi valleys; return to Paro. Day 14: Return flight on Druk Air to Kathmandu.